@mattstratton FALSE • If it was more than just tools, why would we have so many of them? • What will it take to get you in a devops today? • But what does HR know anyway? • Windows is all click-next, right? 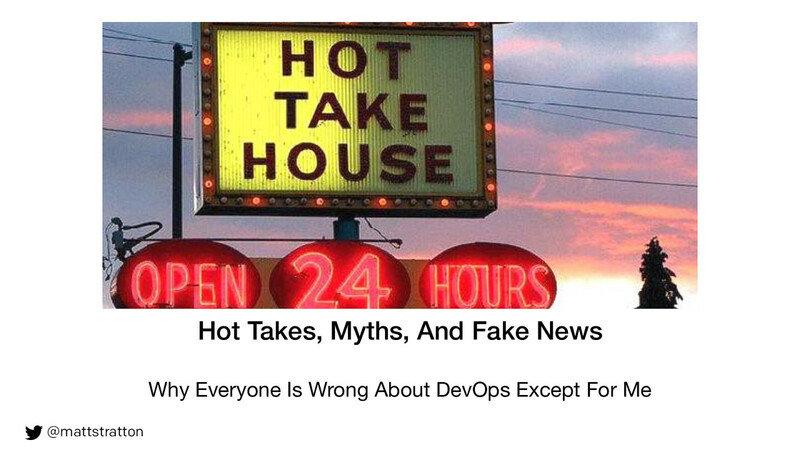 View Hot Takes, Myths, And Fake News - Why Everyone Is Wrong About DevOps Except For Me. Everyone has an opinion about DevOps. The problem is, most people’s opinions are wrong. In this Ignite, I’ll spin through some of the more popular misconceptions about DevOps of the last year or so, and clarify them as only I know how. Will Kubernetes save your soul? Are enterprises too stodgy for DevOps? Is immutable infrastructure even a thing? Can you devops without kitten gif’s? I’ll bust myths and take down thought-leaders with my tongue planted firmly in cheek.